OXFORD, Miss. 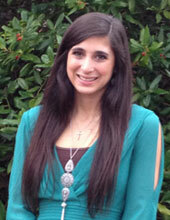 Brooke Fratesi, a University of Mississippi undergraduate student in Communication Sciences and Disorders, has been named the School of Applied Sciences Student of the Month for February 2013. Ms. Fratesi is a University of Mississippi Varsity Cheerleader, a member of the National Student Speech Language Hearing Association, a University of Mississippi National Cheer Competition Team Member, Gamma Beta Phi Honors Society Member, and a member of the Tri Delta Sorority. In the past, she has been a counselor at Abbie Rogers Civitan Camp for Children and Adults with Significant Disabilities.